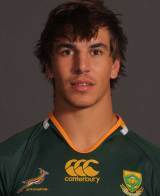 Etzebeth continued a steady stream of talented and tenacious South African locks with a call-up to the senior squad in 2012. After making his Super Rugby debut for the Stormers against the Hurricanes in 2011, he quickly established his place at the heart of their pack the following season, producing rugged performances as the Cape Town franchise battled towards the summit of the tournament. A former Under-20 representative, he was handed a Test debut against England in June 2012 - alongside fellow new cap Juandre Kruger and following the retirements of Bakkies Botha and Victor Matfield.